Reading and share top 24 famous quotes and sayings about The Egyptian Gods by famous authors and people. 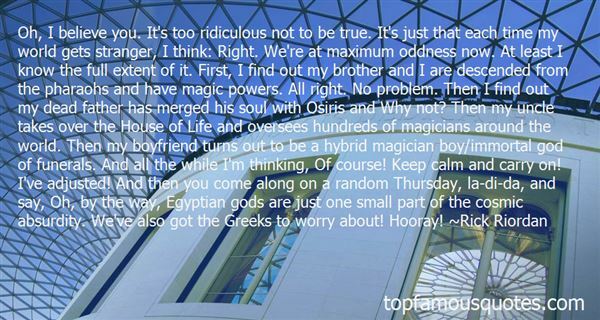 Browse top 24 famous quotes and sayings about The Egyptian Gods by most favorite authors. 1. "Except for a God who sits down after the universe begins, all other gods conflict with the assumptions of science." 2. "The gods always hear our prayers but seldom choose to answer." 3. "The souls of heroes are forged by the gods and tempered with the pain of life." 4. "Since I didn't have any world-class fencing skills, I kicked Cernunnos in the nuts again. I didn't have to know how to use a sword to do that, and he was standing there like he was asking for it, so it seemed justified. Shock and rage filled his green eyes all over again and he doubled. I guess there must be rules that people fighting gods usually followed. Next time, maybe someone would give me a primer." 5. "In the Library"for OctavioThere's a book called"A Dictionary of Angels. "No one has opened it in fifty years,I know, because when I did,The covers creaked, the pagesCrumbled. There I discoveredThe angels were once as plentifulAs species of flies.The sky at duskUsed to be thick with them.You had to wave both armsJust to keep them away.Now the sun is shiningThrough the tall windows.The library is a quiet place.Angels and gods huddledIn dark unopened books.The great secret liesOn some shelf Miss JonesPasses every day on her rounds.She's very tall, so she keepsHer head tipped as if listening.The books are whispering.I hear nothing, but she does." 6. "Even as a very young man, I knew that my family is like a plant. Uproot it, and it will wilt. Pluck away at it, and it will die. But leave it to thrive in the soil, untouched, and it will weather both gods and winds. It is born with the soil, and it will live so long as the soil shall live." 7. "Never invoke the gods unless you really want them to appear. It annoys them very much." 8. "Many who have learnedfrom Hesiod the countless namesof gods and monstersnever understandthat night and day are one"
9. "Lucy, a girl's name for Lucifer. That my mother would have found me devil-like did not surprise me, for I often thought of her as god-like, and are not the children of gods devils? I did not grow to like the name Lucy-I would have much preferred to be called Lucifer outright-but whenever I saw my name I always reached out to give it a strong embrace." 10. "Even gods decay. Like, in 1890 somebody sold off thousands of mummified Ancient Egyptian sacred cats - _for fertilizer_. Get the point? Constancy isn't." 11. "Men and women will forever make gods of others rather than see the god in themselves." 12. "Lakewalker legends say the gods abandoned the world when the first malice came. And that they will return when the earth is entirely cleansed of its spawn. If you believe in gods. ""Do you? ""I believe they are not here, yes. It's a faith of sorts." 13. "Anyway, the title The War of the Insect Gods came before we had that ending, before we knew they had become gods. That we knew the evolutionary cycle they went through. Before we even knew anything about that. We had an ending." 14. "Man is certainly stark mad; he cannot make a worm, and yet he will be making gods by dozens." 15. "Do not look upon this world with fear and loathing. Bravely face whatever the gods offer." 16. "Never wish ill on someone else. The gods may become confused and bring that fortune to you. Conversely, this may be another reason to wish well on others. That way even a garbled wish can only have a positive outcome." 17. 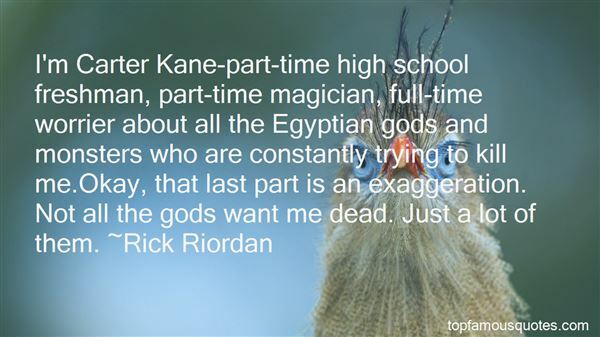 "I'm Carter Kane-part-time high school freshman, part-time magician, full-time worrier about all the Egyptian gods and monsters who are constantly trying to kill me.Okay, that last part is an exaggeration. Not all the gods want me dead. Just a lot of them." 18. "Brother dear," I said, "did your soul leave your body while Amos was talking, or did you actually hear him? Egyptian gods real. Red Lord bad. Red Lord's birthday: very soon, very bad. House of Life: fussy magicians who hate our family because dad was a bit of a rebel, whom you could take a lesson from. Which leaves us—just us—with Dad missing, an evil god about to destroy the world, and an uncle who just jumped off the building—and I can't actually blame him." I took a breath. 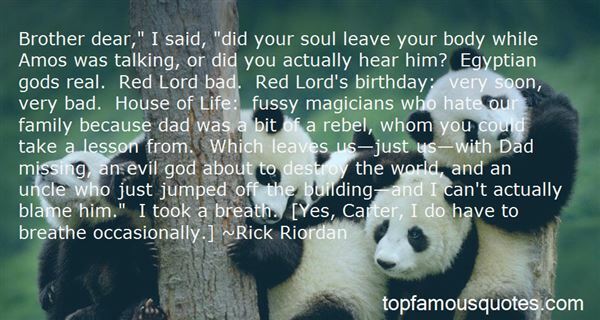 [Yes, Carter, I do have to breathe occasionally.]" 19. "Oh, I believe you. It's too ridiculous not to be true. It's just that each time my world gets stranger, I think: Right. We're at maximum oddness now. At least I know the full extent of it. First, I find out my brother and I are descended from the pharaohs and have magic powers. All right. No problem. Then I find out my dead father has merged his soul with Osiris and Why not? Then my uncle takes over the House of Life and oversees hundreds of magicians around the world. Then my boyfriend turns out to be a hybrid magician boy/immortal god of funerals. And all the while I'm thinking, Of course! Keep calm and carry on! I've adjusted! And then you come along on a random Thursday, la-di-da, and say, Oh, by the way, Egyptian gods are just one small part of the cosmic absurdity. We've also got the Greeks to worry about! Hooray!" 20. "Though men determine, the gods doo dispose: and oft times many things fall out betweene the cup and the lip." 21. "Today evolution of human intelligence has advanced us to the stage where most of us are too smart to invent new gods but are reluctant to give up the old ones." 22. "On top of this was the official indigenous Egyptian government that, though it was quite toothless, various British officials periodically felt the need to pretend to consult in order to maintain the appearance that the wishes of the actual inhabitants of Egypt somehow mattered." 23. "He was overconfident", she told him. "And I won so the gods must have thought I was right. Otherwise they'd have made me lose. You know how trial by combat works." "You won because you were good" he corrected her. "I find it hard to believe the gods sit forever about the Divine Realms betting on jousts and trials by combat." 24. "Valmiki the Poet held all the moving world inside a water drop in his hand.The gods and saints from heaven looked down on Lanka,And Valmiki looked down at the gods in the morning of Time." I want to have fun. Life ain't no dress rehearsal. I want to have fun. I'm a comedian; I ain't no politician. So everything I do is with humor, with love."